Over the past several years I have become increasing interested in the history surrounding World War II and because of that I have begun reading more and more historical fiction books dealing with this subject matter with many more waiting to be read. One thing that I really enjoy about reading them is that each one deals with a different aspect of that time period, some on the war itself with others on what it was like living in that period and being affected by the war. 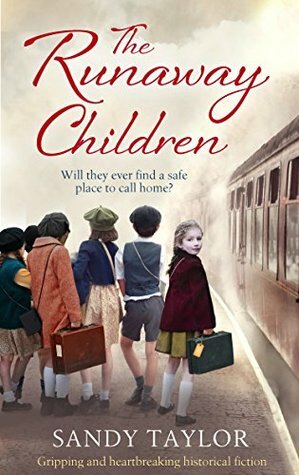 The Runaway Children by Sandy Taylor dealt with an aspect of the war that I was not familiar with and found to be very interesting and tragic. This story follows two sisters, Nell and Olive, thirteen and five at the opening of the story, as they are forced to evacuate London in 1942 as the city is being bombed. The children of the city, and many others, were evacuated to the surrounding countryside in order to keep them safe from the bombings and constant air raid sirens. Unfortunately this meant that the children where placed on trains that sent into areas that did not know to live with people that had never met. For Nell and Olive all starts off well. They are taken in to loving home in a picturesque village, but before too long circumstances and they were forced to move on. Along the way they learned the hard way that there are both good and bad people in the world. I really enjoyed this read, though I did find it a bit slow in some parts. I loved watching the bond between Nell and Olive develop from simply sisters to best friends over the years that they spent together on their own as well as the development of Nell as a character. Overall Olive was my favorite character with her witty remarks and her smart comments and I found myself smiling several times as I read along. I would definitely recommend this book for those who enjoy historical fiction. It opened my eyes to an aspect of World War II that I was not aware of. I look forward to reading more my Taylor. Thank you to NetGalley and Bookouture for the advanced copy of this book.